Are you an accident-prone person who has had a periodic timeline of minor or major accidents throughout your life? Or, are you a sports-enthusiast who has to, many a times, put thy body in line to deliver much anticipated performance? Or, on the contrary, if you are a person who has/had issues with weak bone structure or joints, then it is time to say a thank-you to an invention that has helped us all in making our life a little easier – The Knee Brace! A knee orthosis (KO) or knee brace is a brace that extends above and below the knee joint and is generally worn to support or align the knee. Partially or completely immobilizing of the knee through a knee brace can prevent flexion or extension instability of the knee in cases of neurological or muscular impairments of muscles, or when the ligaments or cartilages of the knee are damaged. Its impeccable utility to prevent further damages to knees has made it the first-approach-solution for common knee injuries such as fractures, dislocation, sprain etc. 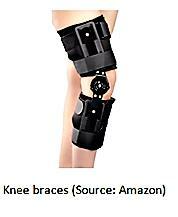 Though everyone has an idea of what knee braces are, much cannot be said about its actual origin with complete surety. A slight glimpse through the pages of history will let you acknowledge its presence in Egypt, where splints or the early form of support were found on mummies, as well as in ancient Rome, the home of Gladiator. But, the most legitimate proof probably is the first orthopedic institute established in the year 1780 by Jean Andre Venel, considered by some to be the father of orthopedics. The modern pioneers of orthopedics and bone-settings were Hugh OwenThomas, a surgeon form Wales, and his nephew Sir Robert Jones. Despite the fact that many ground-breaking works started taking shape in the nineteenth century, it was not until the dawn of the twentieth century that the patent world witnessed a real-interest in protecting these inventions. 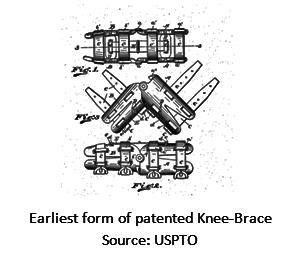 One of the earliest patents filed in the United States, in the field of knee-braces, was Patent # 859962, titled “Knee-braces” granted on July 16, 1907. From there onwards, the patenting activity has grown in leaps and bounds. 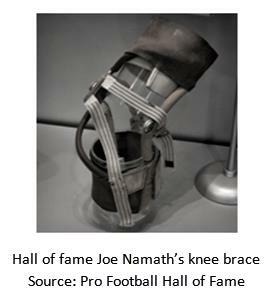 Besides, the importance of knee-braces could also be inferred from the statistics presented by the American Academy of Orthopaedic Surgeons (AAOS) stating that in 2010, there were roughly 10.4 million patient visits to doctors’ offices because of common knee injuries such as fractures, dislocations, sprains, and ligament tears. The knee being the largest joint in the body is also one of the most easily injured. Data obtained from National Electronic Injury Surveillance System (NEISS) also proves this statistically. The susceptibility of the knee towards injuries has been turned into an opportunity by major companies, well supported by the advancement in science and technology. With the advent of augmented assistive device technology such as the KEA (Knee Extensor/Extension Assist), a novel attempt to enhance the role of the musculature to promote healthy knee function is explored. Also, an article published in the journal of Neurological Physical Therapy puts forward the concept of a computer controlled Smart-knee brace that is designed to dynamically control the knee while taking stances, and allowing unrestricted knee motion during swing. Importantly, there has also been a noticeable paradigm shift in the mindset with which knee braces were used. This can be visible in many sports and high-thrill adventurous events, where the utility has changed from “restricting further damages” to preventing occurrence of damage in the first place itself. This has resulted not only in the modification of structure and materials required to make these braces but also in its application paving the way for two kind of braces – Functional knee braces and Prophylactic knee braces. Taking this stride ahead, many leading companies are investing immensely to get a strong claim on the intellectual property concerning knee-braces. Major players like DePuy International Ltd., Ossur HF, Zimmer Inc., and DJ Orthopedics LLC are important stakeholders with global presence. Taking clue from the constant number of patent applications filed in the last 5 years one thing is for sure, the need and the market for knee-braces will not fade away in the coming years. Be it our passion to push the bar to experience the thrill of our lives, or our propensity to stay healthy and not be a medical liability, knee-braces will always remain an indispensable part of our lives.